My cron does not work?! For those actions to be executed, AcyMailing needs to be triggered regularly, and each time AcyMailing is triggered, it will check if some tasks have to be executed and then do what needs to be done. 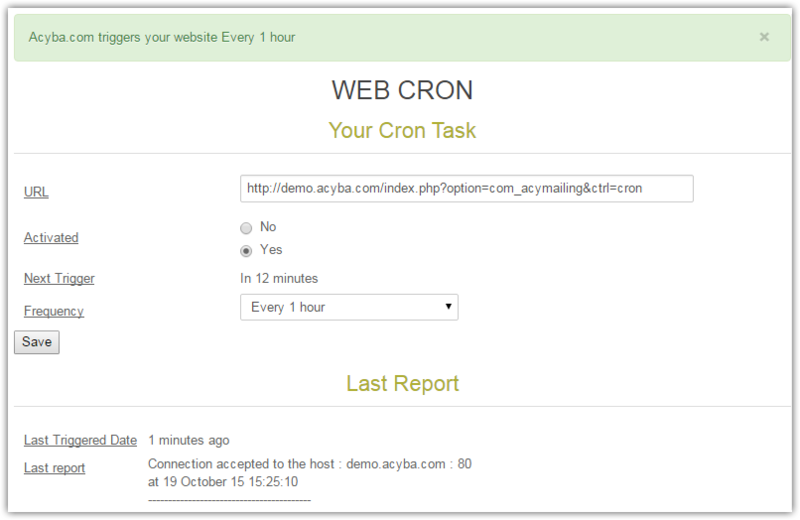 A cron task is a system which will automatically trigger AcyMailing without any human intervention. This is a one-time setup... Once done, you won't have to think about it any more and all automatic actions will work. 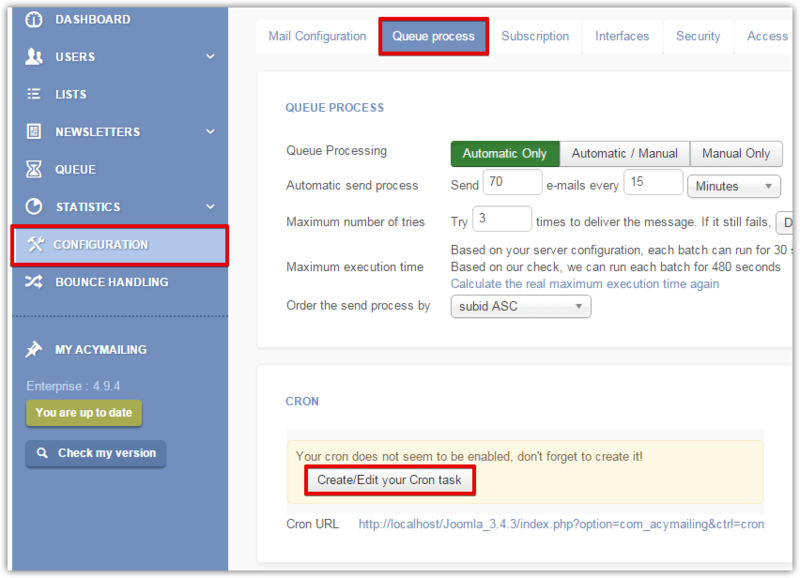 As some hosting companies don't enable you to create a cron task on your own server and also because some of our users have no clue what's a cron task, we created a cron service and an easy way to add a cron task directly via your AcyMailing configuration! On this interface, you can set AcyMailing to send X e-mails every Y minutes using the automatic only send process. Please remember the frequency displayed here is just for security (so that your website won't be triggered too often) but this parameter has no impact on the real cron frequency (they both should have the same value). A popup will open and you will directly see your cron url added (you don't have to change it!). This frequency should be the same as (or bigger than) the one you specified on the "automatic send process" parameters. That's all you have to do and now our server will trigger your AcyMailing components at the specified frequency. If you have the possibility and the knowledge to create a cron task on your own server, then you should do it and stop the cron task on our server to be completely independent from our server. You can contact your hosting company for directions on how to set it up on your hosting plan. You should configure the cron on our server (directly via the AcyMailing Configuration page) OR on your server, not both. 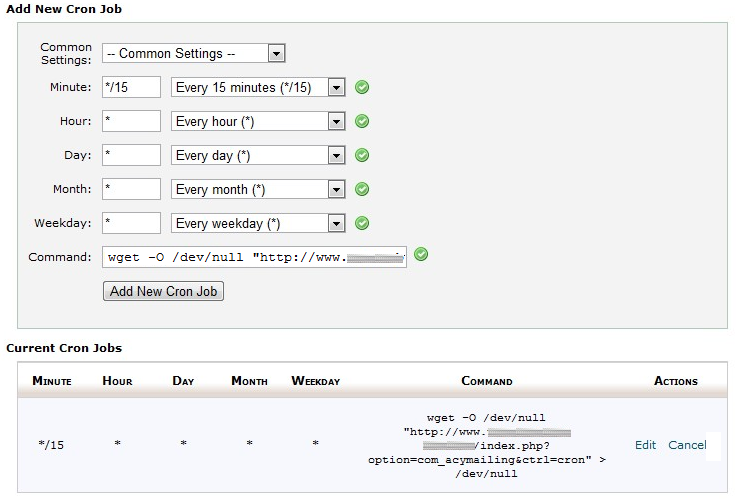 You can see your cron url on your AcyMailing configuration page, tab Queue process. If you create your own cron, you can also configure it to trigger AcyMailing every 15 minutes only on specific time range. This part is for advanced users, really. And if you don't understand it that's because you don't need it! You can add the additional parameter skip in your cron command which should be a list of actions you don't want Acy to execute for this cron. On the Report area, you can see an option to have AcyMailing sending you a report each time it is triggered. If you turn ON this option, then AcyMailing will send you an e-mail each time your website is triggered so it should send you an e-mail every 15 minutes (well, depending on your cron frequency). So you can either configure your SEF component to not transform non-SEF into SEF urls or directly write your sef cron url on our cron interface. If you use a security component on your Joomla website, this component might block our cron task. RSFirewall: You should disable the DoS protection from the Components > RSFirewall > Configuration > Active scanner configuration options. If you use our own web cron service, you should check that our server is allowed to trigger yours. Our server is located in France... if you use RSFirewall or another security component, please make sure this country is not blocked. I'm using a web cron service which triggers my website every 15 minutes. The service is not working any more and it's apparently due to the fact their server has been filtered. Could you please make sure that the server 178.23.155.153 is able to trigger my website? Sometimes cron jobs can't trigger an url including a "&" or can only trigger a script (instead of an url). Then configure your cron to trigger that script. Please don't forget to replace yourdomain.com by the url of your own website.